Hearing aids play a very important role in the lives of those who are hard of hearing. If you have recently gotten hearing aids, it is important to ask your hearing instrument practitioner about how to care for hearing aids. However, here are some of the most basic things that you should know about how to properly care for your hearing aids in order to get the longest life out of them. - Never wear hearing aids when you take a shower, go swimming or in the rain without anything to cover your head. Moisture is known to cause damage to hearing aids. Although there may be situations in which moisture damage is unavoidable, it is often almost always preventable. - Find out from your hearing instrument practitioner how your hearing aids need to be cleaned internally. It will really depend on the specific hearing aid model that you have chosen. Although you can find basic information online about how to do it, you should not attempt to clean a hearing aid internally until you have asked your hearing instrument practitioner about how to do it. - Never forget to clean your hearing aids externally. You will do this by wiping off the hearing aids. A dry tissue or soft cloth are the best things to use. The best time to clean the exterior of your hearing aids is in the morning. The reason that you will want to wipe your hearing aids off every day is to get rid of any wax or oils from your body that may have collected on the outside of the hearing aids. - Clean the ear mold of the hearing aid. The best time to do this is at night. All that you need to do is wipe it off with a dry tissue or soft cloth. Keep in mind that ear molds need to be matched up to the correct hearing aid, so it is best to only clean one at a time. Sometimes, you may find that wax or oils enter the ear mold of the hearing aid. 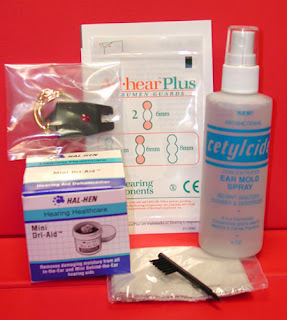 If you have any questions about how to clean the ear mold, ask the hearing instrument practitioner. - Ask your hearing instrument practitioner about a Dry Aid Kit. It is known to be one of the best ways to keep hearing aids protected from wax and moisture in the air. Feel free to contact me if you would like some more information about your hearing aids!